NEW DELHI (Reuters) - Saudi Arabia will release 850 Indians from its prisons after a request from Indian Prime Minister Narendra Modi during its Crown Prince Mohammed bin Salman's visit to New Delhi, India's Foreign Ministry said on Wednesday. Saudi jails hold the greatest number of Indians incarcerated in any country abroad. As of January 2019, 2,224 Indians were jailed in the kingdom for crimes including murder, kidnapping, bribery, cheating, and offences related to drugs and alcohol, according Indian Foreign Ministry figures. Some 2.7 million Indians in Saudi Arabia form the largest expatriate community in the kingdom, with many working in low-paid jobs in sectors such as construction, domestic services and retailing that Saudis spurn. 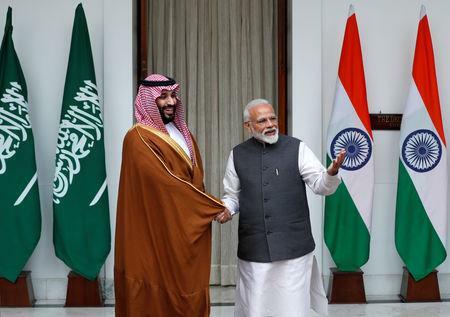 "At the request of the PM @narendramodi, His Royal Highness the Crown Prince of Saudi Arabia has ordered the release of 850 Indian prisoners lodged in Saudi jails," India's Foreign Ministry spokesperson said in a tweet. On Monday, Saudi Arabia ordered the release of about 2,100 Pakistani prisoners from its jails, according to Pakistan's information minister. 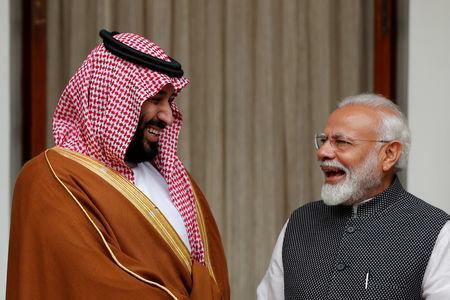 Prince Mohammed, Saudi Arabia's de facto ruler, paid a visit to India's arch regional rival earlier this week, before heading home and then flying to New Delhi. On Sunday, Saudi Arabia signed investment agreements with Pakistan worth $20 billion. In New Delhi on Wednesday, Prince Mohammed said he expected investment opportunities worth more than $100 billion in India over the next two years. The Crown Prince's Asian tour, which will include China, is regarded as part of an effort to help rebuild his reputation abroad after the killing last October of Saudi journalist Jamal Khashoggi, a critic of the Saudi leadership. Saudi officials have denied accusations that Prince Mohammed ordered Khashoggi's murder in the Saudi consulate in Istanbul, and have detained 11 suspects in connection with the killing.